2. Iron or core losses. where Ra = Armature winding resistance. and Ia = Armature current. where Rsh = Shunt field winding resistance. 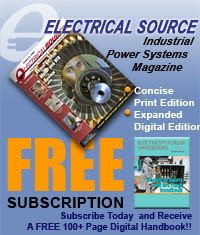 In a compound d.c. machine, both shunt and series field copper losses are present. In addition to the copper losses, there exists brush contact resistance drop. But this drop is usually included in the armature copper loss. There are few losses which vary with the load but their relationship with the load current can not be identified in simple manner. Such losses are called stray load losses and are the part of variable losses. These occur in the windings and the core. These include copper stray load loss and iron stray load loss. These stray load losses are difficult to measure or mathematically calculate hence practically taken as 1% of the output for the d.c.machines. Many times these losses are neglected. These losses are also called magnetic losses. 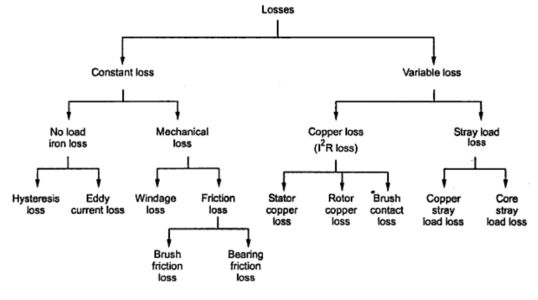 These losses include hysteresis loss and eddy current loss. η = Steinmetz hysteresis coefficient. where V = Volume of core in m3. f = Frequency of magnetic reversals. This loss is basically due to reversal of magnetization of the armature core. t = Thickness of each lamination. V = Volume of core. The hysteresis loss is minimized by selecting the core material having low hysteresis coefficient. While eddy current loss is minimized by by selecting the laminated construction for the core. These losses are almost constant for the d.c. machines. These losses consist of friction and windage losses. Some power is required to overcome mechanical friction and wind resistance at the shaft. This loss is nothing but the friction and windage loss. The mechanical losses are also constant for a d.c. machine. The magnetic and mechanical losses together are called stray losses. 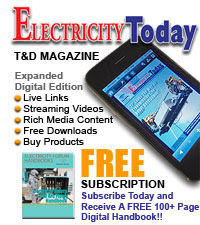 For the shunt and compound d.c. machines where field current is constant, field copper losses are also constant. Thus stray losses along with constant field copper losses are called constant losses. 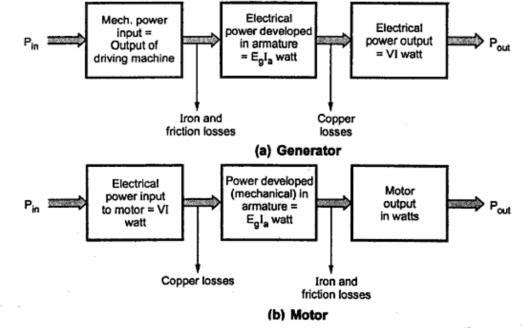 While the armature current is dependent on the load and thus armature copper losses are called variable losses. The Fig. 1 shows the various types of losses taking place in a d.c. machine. The power flow and energy transformation diagrams at various stages, which takes place in a d.c. machine are represented diagrammatically in Fig. 2(a) and (b).